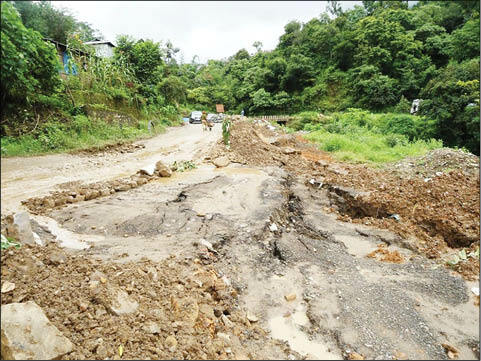 Incessant rain has taken its toll in Nagaland with a section of the National Highway 29 sank in around two kilometers from capital city of Kohima. Meanwhile, hundreds of vehicles, especially trucks were stranded after the section of the NH 29 below a petrol depot here sank more than 10 feet. According to concerned officials, the road could not take the heavy load of tons of soil dumped by its side and with incessant rains, sank in early hours of Sunday. Meanwhile, traffic to and from Kohima has been diverted through two alternative routes- via Jotsoma by-pass road or via Peducha-10 mile (Wokha road). While the Peducha-10 mile (Wokha road) can be used by all types of vehicles, the Jotsoma by-pass road will be allowed only for light vehicles, officials said. According to officials, it would take around three weeks for complete restoration as fresh earth cutting will be required. However, issues like land compensation and other related matters would have to be sorted out before earth cutting. Meanwhile, Border Road Task Force (BRTF) have been entrusted to maintain the Jotsoma by-pass road. Later on Sunday, State PWD Minister, Tongpang Ozukum and other officials of district administration, police, State Disaster Management and PWD engineers visited the affected areas and also inspected the possible alternative roads including 10 mile to Peducha road, Jotsoma road and Forest colony Kohima.